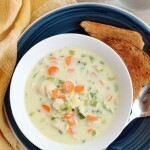 Chicken Pot Pie - Dessert Now, Dinner Later! 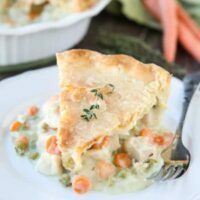 This classic Chicken Pot Pie is made from scratch with a creamy and flavorful chicken and vegetable filling tucked inside of a flaky pastry crust. 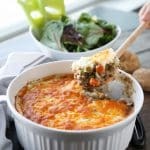 Homemade comfort food that the whole family loves! If there’s one meal my family loves in the cold weather months, it’s chicken pot pie! We often make a quick chicken pot pie by cooking the filling and making some garlic cheese biscuits on the side. Or we’ll make a biscuit crumble to go on top. 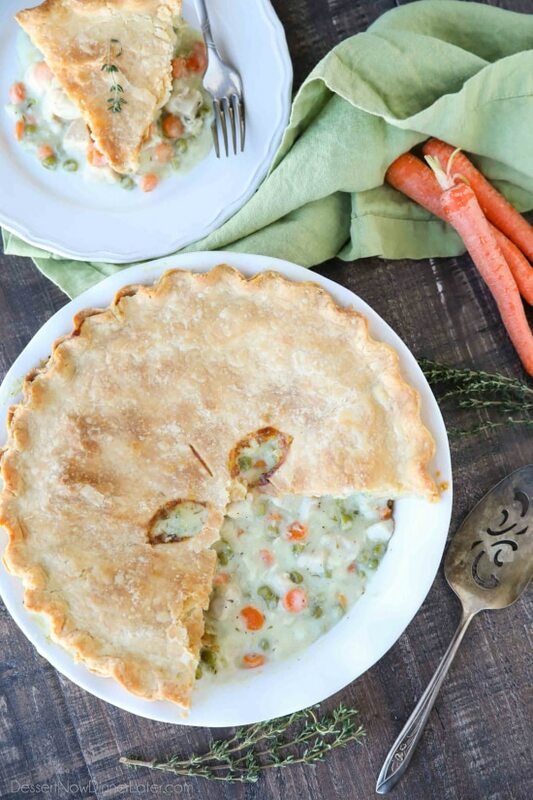 But when I feel like making chicken pot pie with a classic pastry crust, it’s totally worth it! WHAT GOES IN A CHICKEN POT PIE? 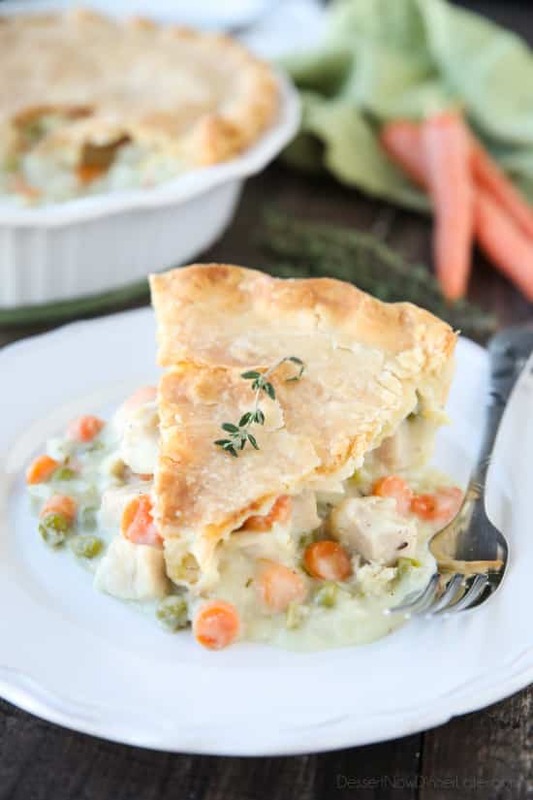 Chicken Pot Pie consists of meat (chicken) and vegetables (onions, carrots, celery, peas) in a cream sauce made from broth, milk, and seasonings (thyme, salt, and pepper). The filling is then poured into a pie crust and baked. 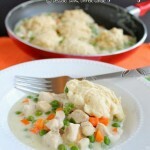 CAN YOU MAKE CHICKEN POT PIE AHEAD OF TIME AND/OR FREEZE IT? 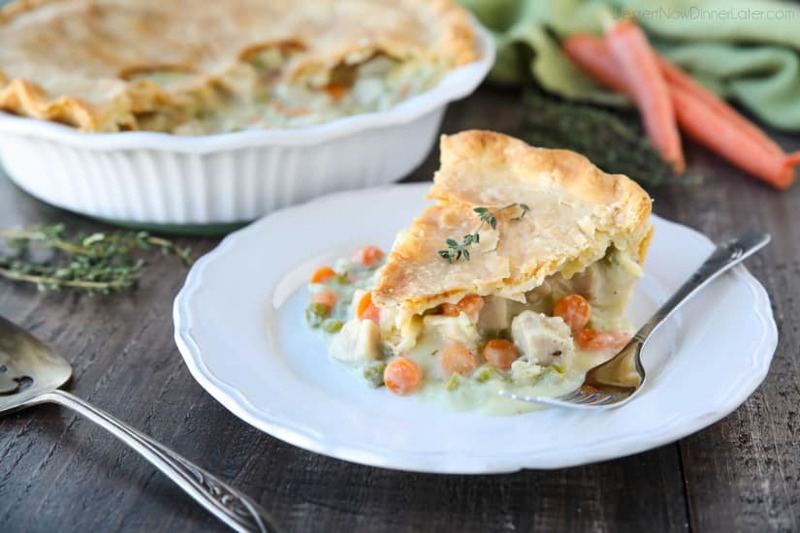 Chicken Pot Pie makes a great freezer meal if you are into meal prep. You can freeze the filling or you can freeze it as an unbaked pie. To use frozen filling: Thaw filling in the refrigerator (may need to stir if it has separated at all), add filling to a prepared pie crust, apply the top crust, then trim and crimp the edges. Bake pie as indicated in the recipe card. To bake a frozen pie: Bake uncovered, for 30 minutes, then cover with foil and bake 30 more minutes or until the crust browns and the filling bubbles in the center. Combine flour and salt in a large bowl. Stir. 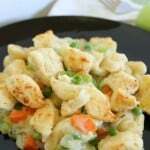 Cut in shortening with a pastry blender, two forks, or pulse in a food processor until pea-sized chunks are achieved. Add the egg, vinegar, and 5 Tbsp of ice-cold water. Mix with your hands. Add more water 1 Tbsp at a time until the mixture comes together in a ball. Empty the contents from the bowl onto a floured surface. Pour oil into a large stock pot. Add cubed chicken and cook until almost done. About 5-7 minutes. Add diced onion, carrots, and celery. Sauté until soft about 5-7 minutes. Add butter and melt. Sprinkle flour over ingredients in pot. Stir and cook for 1 minute until flour absorbs the moisture and is nutty/fragrant. Add broth, milk, and seasonings to the pot. Stir until mixture boils and thickens. Remove from heat and stir in the frozen peas. Set aside. Remove one pie dough disc from the freezer. Roll dough onto a floured surface 1/8-inch thin. Carefully transfer the dough to a 9-inch pie dish (deep dish preferred). Shape the crust to the bottom and sides of the pie dish. Trim excess crust. Pour the chicken pot pie filling into the prepared crust. Roll out the top crust, and place it over the filling. Trim and crimp the edges. Cut slits in the top crust for ventilation. Bake at 375 degrees Fahrenheit for 30-45 minutes or until crust browns and filling bubbles in the center. Allow pie to rest 15 minutes before cutting and serving.